Aquariums come in many different sizes. From the smallest 5 gallon aquariums to the largest 300 gallons and over aquariums, there are plenty of different sizes to choose. However, it may be hard to tell which aquarium size is good for you and your hermit crabs. After considering these factors, finding a tank size should not be hard at all! It may seem unbelievable, but owning land hermit crabs is a fun hobby and can quickly become addicting. I started out with a ten gallon and quickly upgraded to a 20 gallon long, and now I own a 55 gallon which is becoming smaller every day. Before you waste your money on purchasing a smaller tank, it is important to consider if you plan to expand your crab collection. 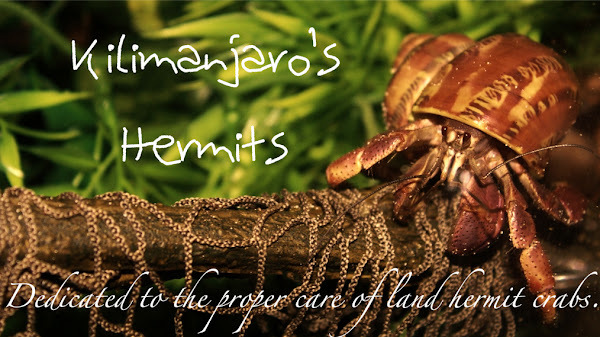 Keep in mind that when properly kept, land hermit crabs can and will grow. Basically, if you're planning on getting a smaller tank now, but would someday like a bigger tank, I would suggest going and buying the bigger right away. There is a chart available that is general rule for how many crabs you can keep in one tank, but the science (if little) is not really behind it. One should be able to tell how many crabs can fit comfortably in a tank. I would say no more than 3 small crabs in a 10G tank and definitely no larger sizes in a 10G. Of course, if you plan to use second levels (such as shower caddies) you may have more crabs. As aforementioned, crabs are addictive and you will be wanting more. Again, go for larger now if you find this to be a serious hobby. Consider how many crabs you want and how many will fit comfortably in a certain size tank. It is understandable that you may live in an apartment and can't afford or fit a 55G in your room. Because of this, limitations must be considered. Crabs are a long-lasting pet (I wish I would have known this) and kids who may be going off to college must consider how they will care for them. This is the problem I am currently facing. Look out for your limitations and pay attention to them. Don't swim in water that you're not comfortable with. This may not seem like an actual factor, but if you are a creative person, you'll fit a lot of stuff in the crabitat and make the most out of it. If you're really creative, a big crabitat is like an open canvas, ready to painted. If you're not creative, a big crabitat can still fit large decorations and make everything seem more natural. Smaller crabitats also have great possibility for looking like small ecosystems. In the end, it's up to you to decide which tank size is best! Consider the factors, and make a decision! Hi Oscar my master Daniel is wondering how many crabs his 27 gallon tank can hold.